Michael Blum, executive director of nonprofit organization Sea of Clouds, will present “Sally Saves Spaces by the Seashore: Protecting Surfing Areas, Marine Cultural Heritage, and the Malibu Historic District” in the Surfboard Room at Payson Library on Thursday, November 1, at 11 AM. The iconic Malibu surfing area, designated as the Malibu Historic District, is the first listing in the National Register of Historic Places centered on surfing history. The project recognizes Malibu's worldwide contribution to surfing's history and culture, secures specific protections, qualifies for other recognition and protection frameworks, and establishes a precedent and process for other projects. 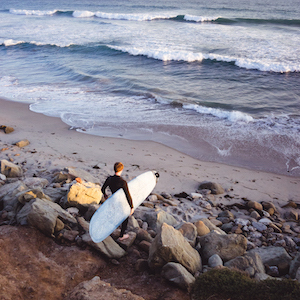 While relevant for its focus on a specific surfing area, the Malibu Historic District is also a rationale for protecting other United States surf breaks and, more broadly, coastal locations possessing cultural and historical significance. Recognizing special coastal areas brings closer together goals of preservation and conservation. It encourages additional energy be placed into coastal conservation to promote a broader, deeper, and more inclusive interpretation of our coastal history. Sea of Clouds is a nonprofit organization whose practice spans the fields of historic preservation and environmental conservation. With a focus on coastal places, the work of Sea of Clouds illuminates the human dimensions of natural ecosystems—connections between nature and culture—to address how communities fully express their interests and values in public trust contexts. For additional information about this lecture, and to register to attend, visit the Pepperdine Libraries website.